At HealthMax, our top priority is always improving the patient’s health while providing a positive, comforting experience. 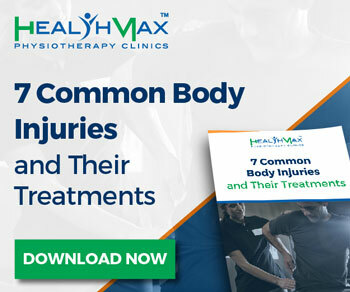 Our clinic in Etobicoke is staffed with experienced physiotherapists, massage therapists, and other treatment experts who strive to implement custom treatment plans that address the needs of every unique patient. Our staff has experience treating a variety of injuries and ailments including including sprains, strains, muscle disorders, chronic pain and much more. We treat injuries that affect everyone, from athletes and workers to car accident victims and individuals suffering from acute conditions. In addition to our suite of wellness services, we also offer a variety of custom braces and orthotics that ensure your path to total wellness is a comfortable one! Letting an injury take control can be a major setback to recovery. Our team of sports physiotherapists understand how pain from an injury can take over our lives, and we know how to fight back with a solution made for you. Take back control of your body from your pain by visiting one of our local physiotherapists in Etobicoke. We factor your current lifestyle into a customized solution designed to work with your body and the injury from which you have been suffering. Our goal is to make your pain relief treatment fit seamlessly into your life, with physiotherapists in Etobicoke that are never too far from home. Working together, we will create an achievable program that puts a pain-free recovery within your grasp. Our team at the HealthMax Physio Etobicoke clinic is committed to helping our patients. We are dedicated to our empowering you through the treatment process while ensuring you make a speedy yet comfortable recovery. Starting with an initial medical assessment, our healthcare specialists develop a specialized, comprehensive treatment plan that is customized for your individual health needs to maximize results. We don’t lecture our patients. Our focus is you and your health so we strive to help you understand your treatment plan and consider your feedback to understand what treatment works best for you. Our team has years of collective experience and can help manage and prevent a range of physical issues caused by illness, slips and falls, motor vehicle accidents, sports or work-related injuries, or even just the natural aging process and extended periods of inactivity. What makes our Etobicoke Physiotherapy team different? Our exceptional team at the Etobicoke physiotherapy clinic works with you to develop a customized treatment plan based on your condition and lifestyle to ensure a speedy recovery. We use a proactive approach to get you back to your optimal health while avoiding the risk of future injuries. We’ll even help you with extended health coverage, motor vehicle accident, and other injury claims! If you are struggling with pain – either chronic or caused by accident, contact us today to schedule your initial appointment. We look forward to helping you through a swift recovery!